Ever since the PAM 382 was unveiled to the world in 2011, the popularity of watches featuring this alloy have also surged. thus, when I was informed by Gnomon of the availability of the Ennebi Bronzo recently, i fled down to the shop to take a look. Within minutes, I've acquired my first bronze watch. Ennebi is not a new name in the world of horology. Based on the information I've scoured from the internet, this brand seem to enjoy some kind of cult status among enthusiasts. I've never heard of this maker until I started visiting Gnomon. "Out of stock" are three words that a synonymous with Ennebi. They are consistently sold out. The wait time for one can stretch from 6 months to a year. I'm not certain of the composition or materials used by Ennebi in it's bronze cases. What I do know is I like it enough to purchase one. What I do know, from other owners is that theirs' have patina-ed nicely over time. 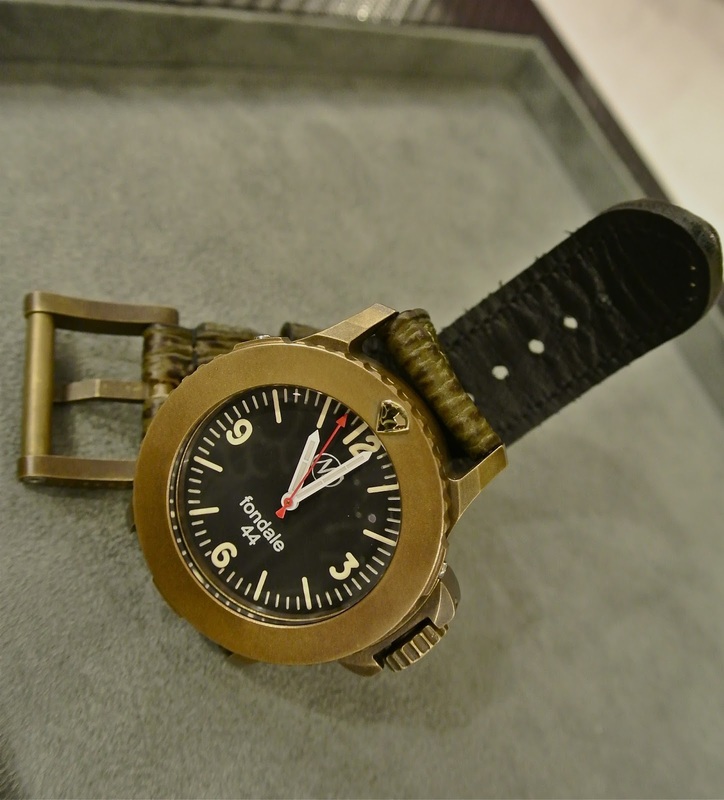 Unlike the recently released Steinhart Marine Officer Chrono Bronzo, the Ennebi case is not as shiny or bright. 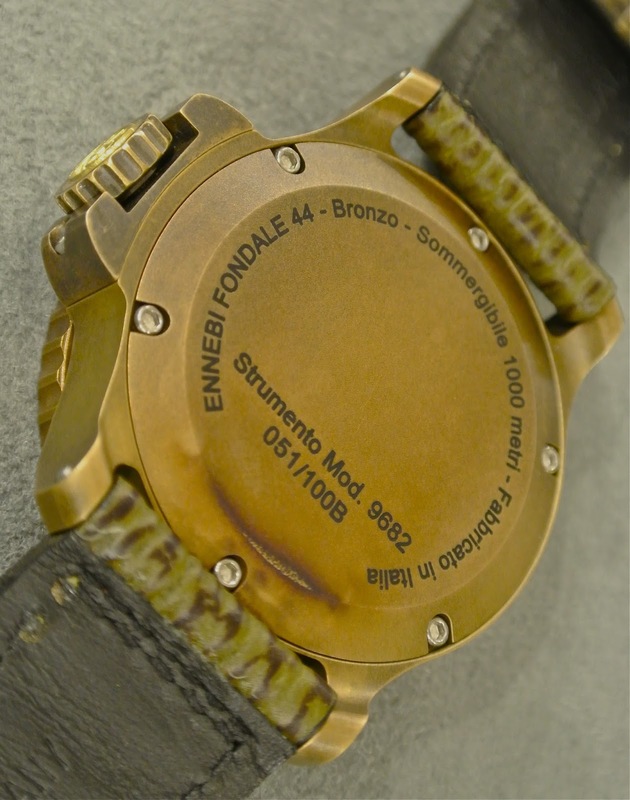 The Ennebi Fondale Bronzo has a matte tint that is rather dull looking. The case had already achieved some patina when it arrived at the Gnomon showroom. 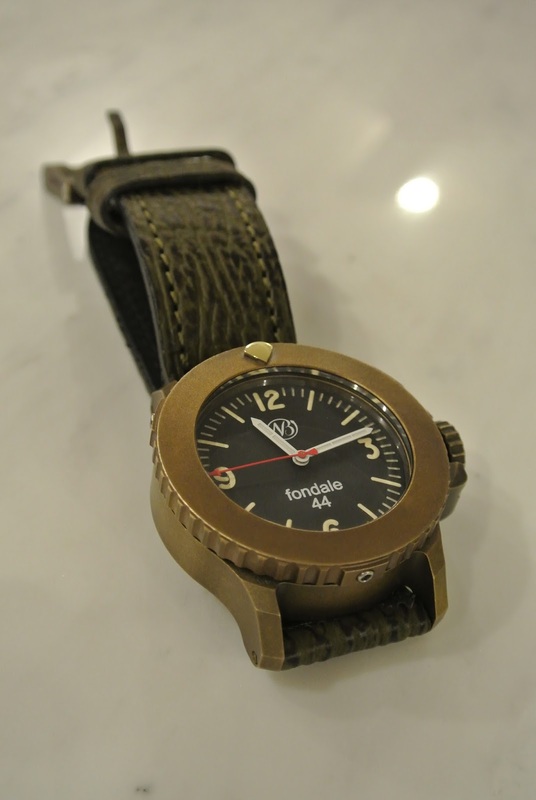 The Fondale Bronzo is fitted with a pari of shark skin straps that matches the case like truffle to scrambled eggs. The here were two dial colours availble but I could only pick the black dial as there were only 2 pieces of olive green dials and both were already taken. The minute markers gives it a military look. However, it also crowds the dial and make the watch look a tad smaller than it's 44mm. In case you're wondering, the "44" on the dial is a reference to it's case size, which is actually the smallest in Ennebi's line-up. The watch case is typical Ennebi - chunky. The Engraved crown, situated at the 3 o'clock position, is shouldered by crown guards. the large and thick crown makes it easy for those with short fingernails to operate. The bi-directional bezel takes a bit of effort to turn. Maybe because it's still new. A complete rotation takes 24 dull, clicks to fulfill. To operate the bezel, one needs to push it down to turn. The case is meticulously finished and is absolutely flawless. The lugs are angled sharply downwards to allow it to hug close to the wrist. The straps are secured to the case by screwed-in bars. This piece is depth-rated to 1000m. However, it does not require a HEV. This is not the only unusual feature of this watch. According to Anders of Gnomon, unlike most watches, the ETA 2824-2 that powers this gem, is fitted from the top and not via the case back. The case is also designed to house the movement directly, without the need for a separate housing or cage like most other watches. The case back is not crowded with unnecessary literature but the bare essentials - the model and reference, serial number, brand and depth rating. Each watch comes with a pair of shark skins and a pair or calf straps, both fitted with Ennebi's signature roller buckle in the same matching alloy. This 44mm beauty sits nicely on my flat-topped, 6 3/4-inch wrist. Thanks to curved lugs, it wraps around the wrist perfectly. The heft is just right as well. This guys is no slouch in the dark as well. The well charged markers glow like a neon sign in the darkest hours and environment. This watch is not perfect but it sure is a really cool one to own. It's beautifully understated and well crafted. I'm ready to cast it's very limited list of imperfections to oblivion. This is also one of the few watches that can go really well with shark skin. In fact, I'm certain it'll look equally good shod with shagreen. This watch has all the 'C's I look for in a watch - Cool factor, Case construction, Conversational piece, Calibre - ETA 2824-2 ( a truly reliable workhorse), and a Cult-like following. - Rarity and waiting time for stock availability. For your record, Ennebi uses G CuSn 12 bronze. What a beauty.